A couple of weeks ago we dashed up to the Big Smoke on a sunny Saturday to catch the last weekend of the Courtauld Institute’s Cezanne exhibition – which was stunning, btw. And what a stunning day all round: Somerset House itself; at the far eastern end of The Strand, children frolicking under its courtyard fountains in the autumn sunshine and the chiaroscuro effect of the afternoon light on the Neo-classical quadrangle’s façades filled me with a sense of satisfaction and contentment normally only induced by a lazy luncheon with a glass of wine. Or two. My delight had much to do with having sourced our train ride snack from the countertop cornucopia of Carluccio’s caffè. 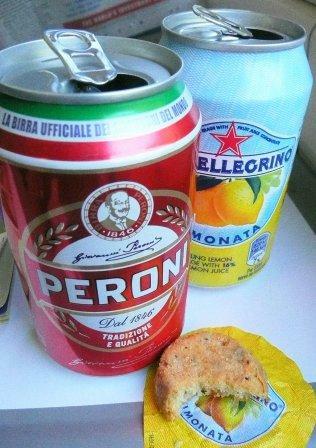 A can of San Pellegrino Limonata for me: sharp, tart and truly lemony; very grown up and tasting nothing like pop, and a tinny of Peroni birra for he. Mine came with a foil cover to keep the sipping hole clean, which doubled up nicely as a micro-plate for our delectable little savoury biscuits: one each of parmesan/herb and walnut/rosemary flavours. Mmm – crisp and crumbly with the quality of their ingredients resonating on the palate: not much more than a morsel per piece yet intensely satisfying. I do hope the delightful Antonio is feeling better after his recent knife mishap. His erudite books and television works are informative and entertaining, and although he is no longer involved with the caffè chain which bears his name, it’s still a civilized pleasure to stop by and shop. Best wishes for your recovery, Mr Carluccio! We visited another bastion of civilization that day – the ever-urbane Fortnum and Mason on Piccadilly. A lunch date elsewhere meant foregoing the joys of the 1707 cellar wine bar, but who wants to be underground on a beautiful day anyway? 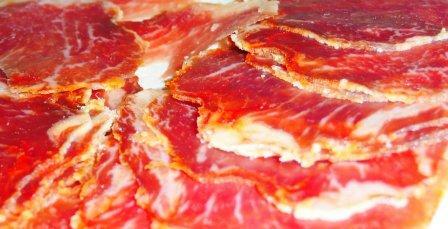 I did discover, however, what the deli counter does with the leftover fat from their Pata Negra Gran Reserva ham – they send it to the kitchen, clever devils. I was hoping to acquire it cheaply for my own devices but at F&M they’re not fools. Instead I came home with a goodly package of saffron – saffron indeed – salami, and a very goodly thing it turned out to be: resembling more a lomo than a salami – no casing, the meat wasn’t chopped and fat evident only in the marbling – but all the more enjoyable for it, especially at just £3 for 100g. The saffron-gilded edge was beautiful to behold and its flavour subtly enhanced the top notch pork flesh. I wish I could say more about this product but there was no information on the label and my server, although charmingly helpful, knew as much as I of its provenance. The mystery remains…anyone out there know?